Witness romance on the range as 19th-century Californians build a life for themselves in the final volume of Diane Noble's popular California Chronicles series! In At Play in the Promised Land, Juliet Dearbourne's grandmother hires private eye Clay MacGregor to track down Juliet after she runs off to New York to seek her fortune. He thinks it's an easy job---until he meets the feisty young woman. 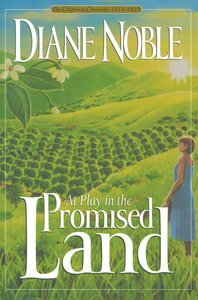 About "At Play in the Promised Land (#03 in California Chronicles Series)"
one family struggles to save its heritage. JULIET ROSE DEARBOURNE ... From childhood she has planned to leave the dull land of her ancestors. When tragedy strikes the family, care of Juliet’s younger sisters doesn’t thwart her desire to run away to New York. Her journey to stardom on stage and in silent film is swift, but the price of fame is dear. CLAY MACGREGOR ... A private detective and part-time stunt flyer for the flickers, Clay is hired by Aislin Dearbourne to track down her missing grandchildren. An easy job. Or so he thinks…until he meets the single-minded Juliet and her five lively siblings. SULLIVAN "SULLY" DEARBOURNE ... Captured by a primitive tribe, Juliet’s brother Sully finds himself in the Brazilian jungles fighting for his life and for that of their father, Quaid Dearbourne.